Sometimes you just have to roll with what mother nature gives you. I have memories from childhood of attempted trips down the Skyline Drive in the Shenandoah National Park in Virginia. I don't think we ever got to drive or see all of it. Sometimes the weather was bad, or it was closed due to something. I may be making that up, it's hard to say. Either way, I've long had a desire to drive the length of the Skyline Drive and see what there is to see. While we were in VA in May, we decided to go check out some caverns and take part of the Skyline Drive to get there so we could see the view. The weather had other plans and it instead gave us a dark and dreary day where it never really stopped raining. Since we were driving out of Charlottesville, we got on the south end of the Skyline Drive and started heading north. The fog wasn't too thick yet, and was beautiful in its own way, but it definitely wasn't the kind of view we were originally hoping for. We got to one of the fairly early overlooks and could see a bit, but needed to continue on so we could get to the cavern. We also figured we'd have at least one other chance to drive up the Skyline Drive on our return trip home in a few days, so we didn't have to stop and spend a lot of time during this drive. I was riding shotgun so I started taking some photos of the road ahead with the LX100. The fog wasn't quite thick enough to obscure everything at this point. A break in the fog at one of the overlooks. We could see it would get heavier as we drove on. As we continued north the fog did indeed get thicker. Eventually, we were moving at a crawl and couldn't see much of the road ahead. We passed overlook after overlook where there was nothing to see, until we passed one in particular where something caught my eye. We were already somewhat resigned to just continuing on and leaving the Skyline Drive as soon as we could (aside from the north and south entrance, there's only two other major ways on or off the Skyline Drive), but I eventually convinced Emily to turn around and head back to that overlook. I was worried the fog would lift, or change in some way, and it wouldn't afford the same view. 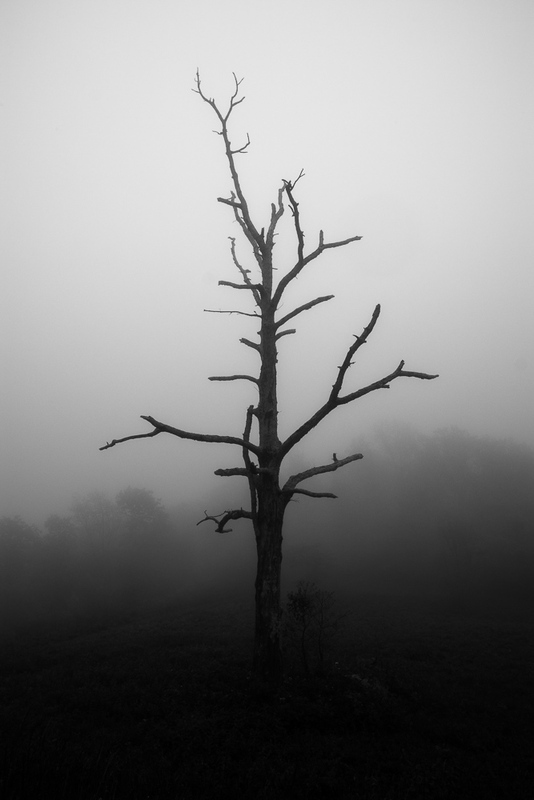 Fortunately, the lone dead tree that caught my eye as we drove past that particular overlook still stood out. I probably spent way too long working out exactly how I wanted to capture it, shooting landscapes, portrait orientation, wide and close or longer and further. Eventually I was satisfied and we got in the car and continued on. Before long, the declaration was made that a bathroom was needed. There aren't a whole lot of those but we pulled in to the first stop that offered one and I went bounding off with my camera again during the brief break. This was my first time really putting the 11-22 to the test on my M5 outside of some walking around downtown Rochester. That continues to prove to be a great combination. At this point, I think we were starting to get hungry and tired of driving through such thick fog. We took the first exit off the Skyline Drive so that we could take faster, straighter roads that would hopefully be below the fog. While we visited and drove some and eventually all of the Skyline Drive later in the trip, this first run up the southern third of it is definitely the most memorable for me. Looking towards the north on Skyline Drive at one of the overlooks.